What happens when a closeted LGBTQ seminarian is called to fill in at the pulpit for their s ick father, and in the process learns the secret truth of the congregation’s desire to leave the ELCA over the 2009 statement on human sexuality? This is the central theme of Tom Jacobson’s new play, Captain of the Bible Quiz Team. Not only is the subject matter of this script timely for a denomination still wrestling with LGBTQ visibility, it is also a story that was formed by Jacobson’s connection to openly LGBTQ Lutherans. In addition to being a prolific and noted playwright, Tom is a friend and faithful supporter of ELM. We hope this play takes off so ELM supporters can see it in their own community! I caught up with Tom as the production was entering its preview weekend, to ask him more about the genesis of the play, the relationship between justice and art, and his hope for the future of the production. Christephor Gilbert: Tell me about your background and how you found your way in to playwriting. Tom Jacobson: I liked writing skits in junior high then started acting in high school. I also had a terrific high school English teacher. When I got to college at Northwestern, I wanted to be an actor but discovered I was much better at playwriting. So I got an MFA in Playwriting at UCLA and then slowly became a part of the wonderful theatre community of Los Angeles. CG: Did you grow up in the Lutheran church? TJ: My dad was raised Lutheran in Minnesota, so we were raised ELCA in Pennsylvania, Florida and Oklahoma (where Lutheran was definitely a minority religion). I still go to church every Sunday and enjoy the Lutheran liturgy and traditions. CG: From looking at your website, you have several plays that have religious themes or people at their center (Apocrypha, The Beloved Disciple, Diet of Worms). How did you, as a playwright, come to settle within this niche of subject material? How does it relate (if it does) to your own spirituality/religious experience? TJ: During church services I tend to get ideas for plays (sometimes from the sermon, sometimes from inattention). I find the conflict between tradition and today an exciting way to approach drama, and religion is always struggling with relevance in the modern world. Reinterpretation of historic religious situations (the relationship between Jesus and the beloved disciple John, the reaction of German nuns to “heresy” of Martin Luther) gives me an opportunity to comment on modern social conflict. CG: What has your knowledge of or involvement with Extraordinary Lutheran Ministries been? Do you know out LGBTQ Lutheran pastors or other clergy (deacons, diaconal ministers)? TJ: I made some friends in Lutherans Concerned in Los Angeles about 30 years ago and have kept up with inclusivity efforts ever since. I attended the extra ordinem ordination of Jeff Johnson, Ruth Frost and Phyllis Zillhart in 1990 (along with a Mapplethorpe exhibition in Berkeley, back when he was also controversial), which I found very moving. I have a vivid memory of Joel Workin’s sermon at St. Francis Lutheran the next morning, when he referred to the bishop as “that fox,” very strong words for anyone with a Biblical background. My own church, Lutheran Church of the Master in Los Angeles, has been Reconciling in Christ for more than a decade. I’ve met a number of LGBTQ clergy over the years (mostly Lutheran). CG: What was the impetus for your telling this particular story? TJ: Joel Bergeland’s internship at St. Paul’s in Santa Monica was partly sponsored by my church, so he came to preach one Sunday. His sermon was the inspiration for my play. Small, dying Lutheran churches like my family church in central Minnesota need the energy, enthusiasm and intelligence I’ve found in many LGBTQ clergy, including Joel, but small rural churches don’t want “extraordinary” ministers. The conflict between hidebound ideology and modern ideas is always interesting to me, and the idea of Joel being called to a conservative rural church sounded like the perfect set-up for a play fraught with tension. CG: Captain of the Bible Quiz Team unfolds narratively as a series of sermons, and the performance is staged in an actual church. Can you tell me about how you came to see the story unfold in this way? 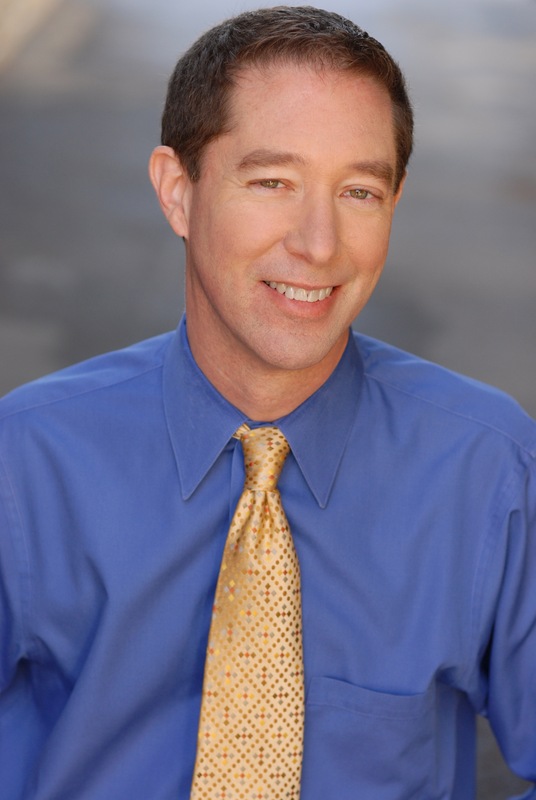 TJ: My church hosted a production of my Chekhov adaptation, The Orange Grove, in 2004 and in 2015 Diet of Worms was performed in the Episcopal cathedral in LA, so I have some experience with site-specific plays in churches. I love using the church–an inherently theatrical space designed for ritual performance–as a church. I like the audience becoming a congregation and taking the role of the antagonist in a play with one actor (the protagonist). Some interesting audience interaction is built into the play, which functions as a form of hyper-realism that has deeply engaged audiences in our workshop productions. I’ve noticed when the audience knows they have a role, they pay attention and stay on their toes (thanks to anxiety as well as excitement). I enjoy audience culpability, and that’s central to this play. CG: I also see that the upcoming performance has four different actors sharing the role of Pastor Landry Sorenson. Is that something indicated in the script, or something that was realized by the director? Tell me more about how this casting devise relates to the theme/intention of the script. TJ: From the very beginning I intended the role to be played by a variety of actors of different genders, ages, and backgrounds. By changing the physicality of the actor from male to female, for instance, the character is changed and so is the story–without changing a word of the dialogue. I’m intrigued by the inherent variability of live performance, and I tend to write in ways that emphasize how every performance (or production) is unique. That excitement of variability is one of the reasons theatre has survived the competition with TV and film–being in the room with a live actor is a thrill, especially if a different actor is playing the role each night. I hope people will see it with all four of our outstanding actors so they can experience the play differently. CG: In conversation with Amalia, she told me that your research for this play involved conducting one-on-one interviews with LGBTQ pastors. What surprises did you discover? Realities you had confirmed? Did the interviews take the story in an unexpected direction from the initial idea for the show? TJ: I expected to learn sad stories of oppression, of anger, of discouragement. The surprise for me was that every minister I interviewed persevered in the face of terrible rejection, loving the church that told them they were not worthy (until 2009). Their passion for God and the church was impressive. Equally impressive were some of the surprisingly happy endings to their stories (even before 2009). One of those amazing stories became the miracle at the end of the play. CG: How do you see your art as an instrument for justice? TJ: I like lying in service of the truth, telling fictional tales that reveal reality. I try to both point out problems and offer possible solutions, while reminding audiences of the humanity of the characters. I hope the audience will sometimes feel culpable and leave the theatre resolute about taking action or at least being a better person. CG: How can theatre affect change that other media can’t? TJ: Theatre is immediate, happening in the moment, not at a remove. It’s also much cheaper to mount a play than film a movie or TV show, so plays can respond more quickly to contemporary issues. CG: What is your hope for this particular script? Do you have a vision for its performance in other sites/cities? TJ: If the show is well received in its first three venues, our hope is that the producer, Rogue Machine Theatre, will find other churches in Southern California willing to host this production. Good reviews and audiences might lead to productions in other churches in other cities. With only one actor performing and the set provided by the church, it’s a pretty inexpensive show to mount. I hope that portability will lead to productions in churches (not just Lutheran) all over the country. 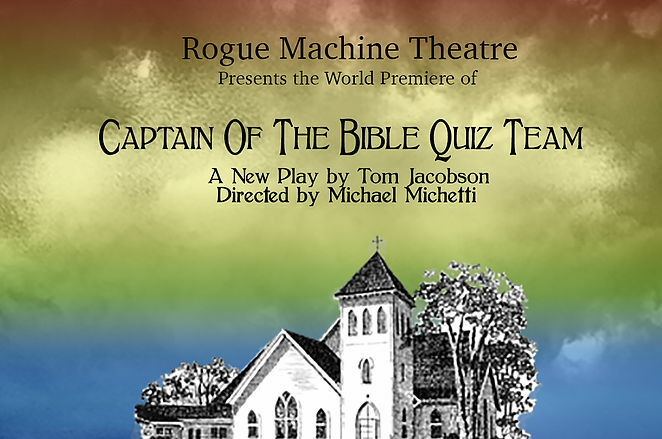 Rogue Machine Theatre presents the world premiere of Captain of the Bible Quiz Team by Tom Jacobson, Saturday August 27th through Monday October 3rd. The production is directed by Michael Michetti and is produced by Stephanie Kerley Schwartz and Anna Nicholas. The performance features Amielynn Abellera, Wayne Tyrone Carr, Mark Jacobson, and Deborah Puette in rotation as Pastor Landry Sorenson. Tickets are $34.99 and can be reserved by calling 855-585-5185. 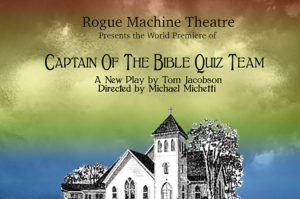 For more information, please visit the production website, captainofthebiblequizteam.com. To learn more about Tom Jacobson visit www.tomjacobsonplaywright.com. Christephor at home with Sylvia. 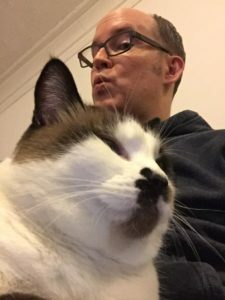 Christephor Gilbert just finished Clinical Pastoral Education and is about to enter his Middler year at Lutheran School of Theology, where he isn’t captain of the Bible quiz team, but does serve as co-leader of Thesis 96, LSTC’s LGBTQ affinity group. You can find Christephor any day of the week reading poetry (Federico Garcia Lorca, Mary Oliver, and Audre Lorde are favorites), thinking about finishing those socks he has been knitting for two years, or watching The Devil Wears Prada for the um-teenth time, with his partner Donald and their three unusual cats. This entry was posted on Thursday, August 25th, 2016 at 5:00 am	and is filed under Blog. You can follow any responses to this entry through the RSS 2.0 feed. Both comments and pings are currently closed.